The HoloLens looks like something out of the future. My HoloLens arrived and I haven’t had much time to learn how to use it. I was able to spend an hour with the device before heading off to work. It looks as cool as it sounds and adjusting it on my head only caused minor difficulties, mostly because I didn’t read the directions. Once I turned the device on with the Start button that is located in a discreet place in back, I was given a tutorial on how to use the HoloLens. Opening your index finger and clicking on an item to select it usually works, but it’s very frustrating when it doesn’t work. Typing my Wi-Fi password proved to be a real task that worked, but made me wish I had a Bluetooth keyboard available. 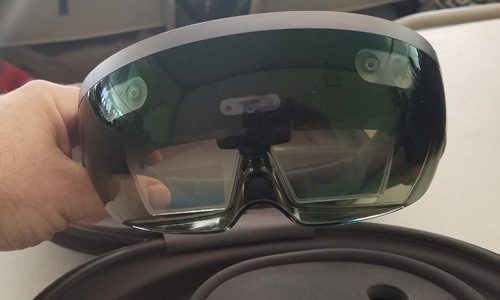 The HoloLens is actually a Windows 10 computer. It’s important to note that the HoloLens runs a full version of Windows 10, although there is no desktop, and I have yet to figure out how to install programs that aren’t from the Microsoft Store. Unlike virtual reality devices such as the Oculus Rift, the HoloLens doesn’t require a computer; it is a computer. The first thing I did was select hologram images from the HoloLens Studio and place them all around my living room. One was a dancing ballerina, another was a spinning globe, and the final one was a man weightlifting. The HoloLens remembered where I put these holographs, even after I turned it off. This was quite an exciting experience and could have been the most “geeked-out” thing I had ever seen since reviewing technology products, but there was one major issue — the narrow field of view. The field of view feels like a smartphone a couple inches away from your face. If you place a globe on your chair and look directly at it, you are likely to see the whole thing. However, move your face too much in any direction, and it will clip the globe, thus ruining the immersive experience. I didn’t think I would love viewing Netflix with the HoloLens, but I do. I set a screen up near my ceiling and watched BoJack Horseman, thinking that movie theaters are going to soon lose business with this type of technology. Of course, if I turned my head too much in one direction, some of the screen would cut off — but this didn’t seem to bother me as much. I need to spend more time with the HoloLens before I can make any major conclusions. And no matter what my conclusions are, it’s important to remember that this is not the full consumer version of the device. 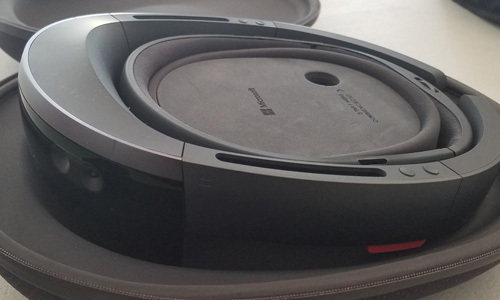 This entry was posted in Review and tagged MIcrosoft HoloLens. Bookmark the permalink.